An anhydrous material does not contain any water (H2O) molecules. Many substances occur naturally as hydrates, compounds that have a specific number of water molecules (H2O) attached to them. This water can often be removed by heating and/or vacuum to give the anhydrous material. Get drying apparatus and other organic laboratory equipment and glassware from Safety Emporium! Anhydrous materials can absorb water from their surroundings and find use as desiccants (drying agents). Examples include the packets of silica gel one finds in some consumer goods, as well as dehumidifying sachets used in clothes closets. See our entry on hygroscopic for more details. Anhydrous materials differ from anhydrides. Anhydrides react irreversibly with the oxygen-hydrogen bonds of water to form new compounds whereas anhydrous compounds simply form reversible adducts with water molecules. The hydrated forms of the compounds shown below can be converted into the anhydrous forms by heating. This provides a convenient way of recycling (regenerating or reactivating) the drying agent. 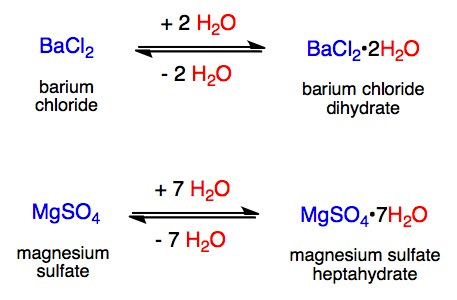 In each example below, note the double arrows between the products and reactants that indicate a reversible chemical reaction. Some anhydrous materials are considered water reactive materials, meaning that they could release a large amount of heat possibly leading to a pressure or chemical explosion. Use such materials only with proper precautions and training and pay very careful attention to the firefighting procedures listed on the SDS! Drying Organic Solutions at CU Boulder. Check out the great pictures. QuickTime movies that show how chemists dry organic solutions with anhydrous magnesium sulfate and use a simple desiccator by Professor Dan Straus at San Jose State University. J.T. Baker (Mallinckrodt Baker) has a handy Desiccant Selection Guide. Common desiccant types and additional information at SorbentSystems.com. Multisorb has an article titled The Power of Desiccant Technology as well as various product information.